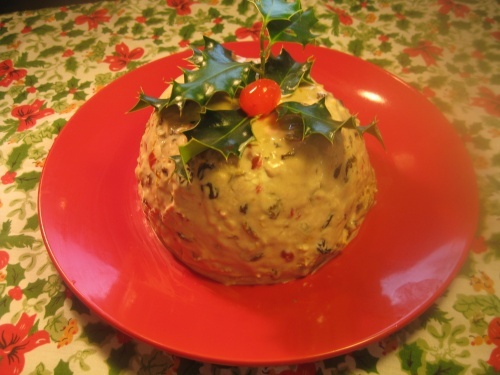 For those who don’t want the traditional rich Christmas pudding or would like a second dessert as an alternative. I suggest this frozen pudding which contains Christmas ingredients and flavours. It is really delicious. One big advantage is that it can be made well ahead of time and served not only on Christmas Day. Put milk and marshmallows into a pan and heat until the marshmallows are nearly melted. Allow to cool. Meanwhile mix dried fruits and candied peel with the sherry or brandy and leave to soak for 30mins, then add the marshmallow mixture, diced cherries, chopped walnuts, cocoa and coffee with the zest of the orange and lemon. Place in the basin and freeze until slightly thickened (about 1 hour). To serve - Turn out and decorate with a sprig of holly. Note: if maraschino cherries are unobtainable use glacé ones.